After many years working with both babies and children and having a keen interest in art, I found this a wonderful way of capturing a treasured memory in silver and after 7 years of producing items as a hobby I decided to start my own business and share my creations. Every piece goes through 13 stages, starting with taking the fingerprint through to the finished item, in 99.9% pure silver. Every piece is a bespoke, handcrafted item with no machines being used and therefore each one is unique and no two items are ever the same. I am now offering you the opportunity to capture a hand/foot beautifully finished in either opal pearl or a bronze effect. Whether you want to capture a newborn baby's hand or foot or a bride and groom's clasped hands, it will be a treasured momento. 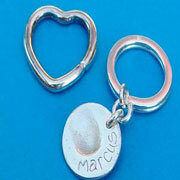 These make an ideal gift for a special birthday, Christening or wedding momento. 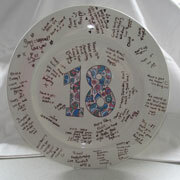 Each piece is hand-painted on your chosen pottery, which is then glazed and fired. 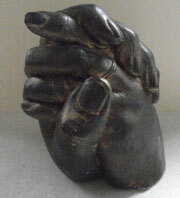 The finished piece is then able to be used and is dishwasher safe, or it can be kept as a display piece.